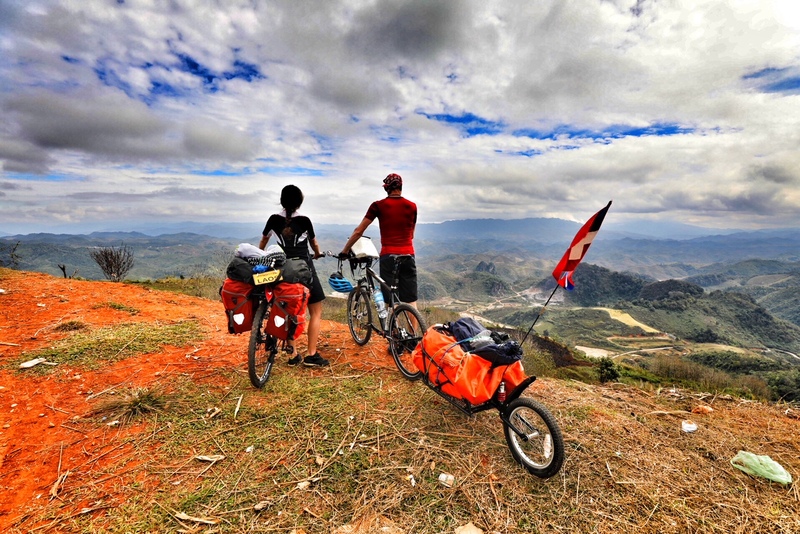 When this Swiss couple set out on a “Dream Journey” pedalling across Asia with some trepidation, the enriching experience was something beyond imagination. Our love story started when we met in an elevator in Geneva. That took us on a journey we had not imagined was possible. One year later we were a couple and got engaged in summer 2017. Soon after we met, we realised that it was not we who had chosen each other, but love had chosen us. We decided to share our passion for life, adventure, sports and supporting people in need. We cycled across Asia (Laos, Cambodia, India and Nepal) during five months, covering 3,500km, 65,000 metres of altitude and zero punctures. In the many places we cycled through, people live very simple lives. Thanks to our means of transportation, we were invited to share the beauty of simplicity with them. In a very healthy way, travelling by bicycle demands tremendous physical and therefore also mental efforts. It is one of the most authentic ways to discover a country. It allows moving fast enough to see different places but slow enough to appreciate things that would remain unnoticed when looking out of a car window. Also, clothing remains always the same because every gram you have to carry costs you more energy. Often, we arrived just before nightfall and had no choice but to gratefully accept the accommodation and the food that was given to us by the inhabitants of the little villages we ended our days at. After such a day, we really knew why we crashed into bed, tired and happy. Will I ever overcome my fear of cycling in the traffic? Will I manage the tough living conditions? Will I be fit enough? Before departure, I did not particularly enjoy cycling and was scared to even cycle through Geneva (which is a well-organised Swiss city, suitable for cyclists). Being one of Christoph’s passions that influences his way of looking at life, I strongly felt that I wanted to experience cycling with him. I understood that undertaking this step would also help me to overcome certain fears. Not only the one about getting hit by a car or falling from my bike but also personal fears. Today, I know that actions motivated from within led me, way beyond my limits. It also taught me to distinguish between irrational fears that blocked me and healthy fears that helped me grow. During our journey, we did not want to simply consume impressions and encounters but actively support people in need. This is why we spent one month volunteering with the Banyan, India’s largest organisation supporting homeless mentally destitute people. We helped with our expertise in business, legal matters, communication, management and design. By even the most conservative estimates, roughly seven per cent of India’s population struggles with some form of mental illness—at least 70 million people, according to the Indian Council for Medical Research. Yet in urban areas, at least half will remain untreated, and in rural areas the treatment gap is estimated at as much as 90 per cent, according to the National Institute for Mental Health and Neuro Sciences in Bangalore. The problems of these ‘forgotten people’ wandering the streets of India is increasing and little help is there for them. Co-Founded by Dr Vandana Gopikumar, the Banyan offers comprehensive mental health solutions focusing on sustainable development goals (SDG3), working together with the Government and key institutions such as the TATA Institute for Social Science. Until today, they have rescued over 3,000 persons from the streets, reintegrated 70 per cent of them back into their families and communities and reached one million people through their outreach programmes. Our goal was to give a voice to the voiceless. What we received through this experience went far beyond what we could have ever given. Did you ever consider taking a sabbatical, spending some time away on an adventure, alone or with your partner? We asked ourselves this question from the day we met and finally made it a reality that we called ‘The Dream Journey’. Our intuition spoke for it, our fears against it: Is this reasonable? Will we find jobs afterwards? Apart from the good this journey did to us personally and from a couple’s perspective, it also helped us to find jobs. Inevitably, when you recharge batteries and let the life in yourself live, you are a fuller person and more interesting for a potential employer. In fact, during our journey we applied for jobs and had interviews and when we returned it took both of us only a few days to get hired. Of course, we were very lucky but both of our future employers valued our sabbaticals and the lessons we brought back. A study published in the Journal of Applied Psychology found that employees experienced a decline in stress after coming back from a sabbatical. According to an article in the Harvard Business Review, the benefits of sabbaticals for companies are only positive. They found that a sabbatical company policy does increase the employers’ motivation and self-confidence. Recruitment specialist Experteer says: Many firms, including 25 per cent of Fortune’s 100 Best Companies to Work For, now offer sabbaticals. So, was this reasonable? Yes, a 100 per cent. Our Dream Journey taught us many lessons, which will accompany us through life. Deprived of every comfort and filter, our curiosity was sharpened like a razor-blade. We realised again the privileges of our Swiss passports, allowing us to travel freely in the world. We experienced days of pure wonder, beauty, encounters, smiles and challenges. Gratefulness and humbleness were our steady companions. Our love has grown stronger. The Dream Journey was the story of a YES to oneself, to each other, to LOVE, to LIFE. Valentine and Christoph are both Swiss but citizen of the world. They have both worked and lived in different countries around the globe. Valentine Bulliard is a multilingual Swiss lawyer with experience in corporate private, public law and litigation. She has worked for international companies and law firms and currently is a Lawyer working for the Swiss Government. She led and initiated international camps for differently abled in Lebanon. For her humanitarian work she was recently decorated. She has co-founded and lead International Development Programs for disabled people in Europe and the Middle East and continues to do social work. She advocates for the rights of disabled and less advantaged people. She is a passionate adventurer and loves playing the violin. Christoph von Toggenburg has been working for nearly a decade in his life in conflict zones all over the world with the UN and International Red Cross. He has initiated global fundraising expeditions such as Bike for Help and Alegria for which he received many international decorations and awards. Christoph is the CEO of the Colour the World Foundation, spoke at TEDx and is a World Economic Forum Global Leadership Fellow.He has three Master’s degrees including Arts, International Relations and Global Leadership. They are getting married in May 2019.